Mexico has a deserved reputation of a macho country within the gay community all around the country. To the generalized discrimination in every social relationship - from work to family - a dozens of homophobic murders every year can be added. The extreme violence that is ravaging the country is practically unnoticed. But there are exceptions to the rule. The last records from 2010 by NGO Letra S reported 628 killings based on sexual intolerance in the period from 1995 to 2008. Nevertheless, there is a region in Mexico where homosexual people, at least homosexual men, are not only widely accepted but even socially valued. We’re talking about the Isthmus of Tehuantepec, a southern territory where zapotec indigenous are predominant and where, unlike other parts of Mexico, homosexual males mustn’t bear intolerance, mockery or bullying. Zapotec people don’t see them as men, nor as women. They give them a name that is exclusive of their language: ‘muxes’. They are considered as a third gender, swinging between the masculine and the feminine ones. This vision has appealed to anthropologist all over the world. “Here in the isthmus we are allowed to live on peacefully with our work, nobody points at us, nobody discriminates us. In other places, you are insulted, if not even put aside”, states Armando Lopez, a muxe elementary school teacher from Juchitan, the most important town of the isthmus (around 100,000 inhabitants). “Muxes”, he adds, “can be teachers, engineer, accountants, merchants or businessmen”, even when many of them use to dresse as women and adopt exotic names as Venus, Pitufina (Smurfette) or Freira Imperia. Even if there are some remnant homophobic attitudes, muxes are respected and, as any other person, can reach prominent roles in the community. 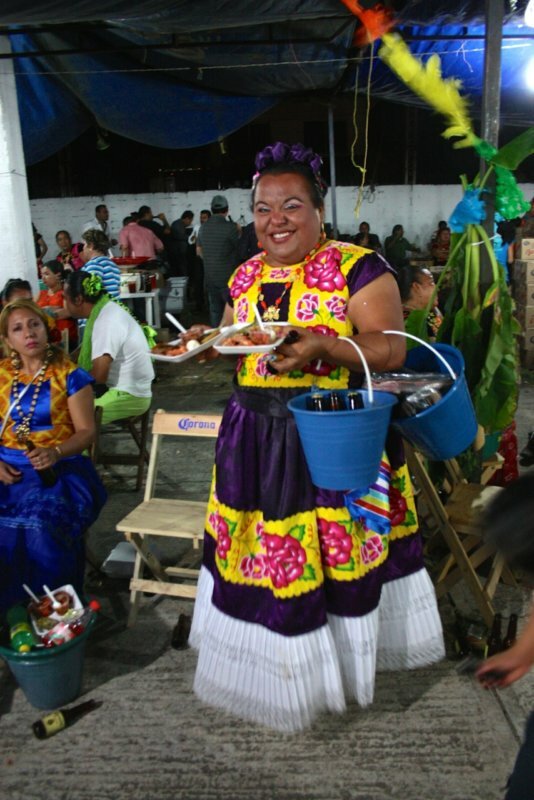 Some of then are successful entrepreneurs, lawyers, university teachers, councilwomen, TV hosts… with no need of conceal their sexual orientation, or avoid the make-up, the colourful zapotec skirts or the flowers in the hair. One of them was even Mexican Congress candidate in 2003. Some people have attributed this mind-set to the zapotec ancestral world vision, but pedagogue Eli Bartolo, Juchitan-born, muxe and researcher of this issue, disagrees. “In the ancient Middle American culture, privileged classes could afford some uncommon sexual practices, but these were not allowed to the lower classes. This was the same in the Greek culture”, he points out. Furthermore, this tolerance, Bartolo goes on saying, is not extendable to lesbians, who are called with the derogatory world ‘nguiu’ in the Isthmus. It’s not either something shared by all zapotecs, but only by those living in Tehuantepec area”. “There are some other zapotec regions not so sympathetic towards homosexuality. So it’s not only something ethnic, there must be another explanation influencing in this tolerance and acceptance”, Bartolo asserts. “But I haven’t found yet a convincing one”. “The muxe can sell in the market, a place where men are not easily accepted (as in zapotec society this is an space almost exclusively for women). Can be also in men places”, as the canteen, explains Felina (cat-like) Santiago as she makes her up in the mirror of her beauty salon. “I think that muxes have two important parts, they are halfway between women and men. They has the men’s strength and the women’s spirit”, she argues. Felina has been responsible for HIV/Aids prevention in the former Juchitan’s local government and secretary of “The Genuine Fearless Searchers for Danger”, a muxe association that has been organizing for the last 40 years a renowned vela. This is how Tehuantepec’s people name the week-end celebrations which every local union, congregation or association make once a year, to which are invited all their member’s relatives and friends. There are dozens of velas along the year and to muxes they have been an integrating element, as their groups organized several of them annually. But the “Fearless” one, scheduled in November, has become a sexual diversity feast with national and even international reputation, as every year it hosts visitors from all over Mexico and from other countries. The concept of muxe embraces any kind of not hetero male sexual option, from homosexuals to bisexuals, transvestites, transsexuals or transgender. “Muxes are muxes, it’s you (westerners) who are categorizing us. It’s a problem of western and European view”, says Bartolo. Shamira Huerta del Monte (Shamira Mountain’s Orchad) has Tehuantepec roots but lives in Oaxaca, the capital of the department where Isthmus of Tehuantepec belongs. There, zapotec people have adapted their way of living to the uses of a big city. Besides, hers is a Mormon family and don’t accept her sexual orientation. “My mother and brothers (the father abandoned them long ago) use to tell me: ‘Why don’t you get yourself a woman? Why aren’t you sorry for what you are?’”, she remarks while partying, dressed with her folk costume, in one of the muxe velas of Juchitan. That’s so even when they haven’t ever seen in her woman outfit. “I only have my nails painted and my hair long. 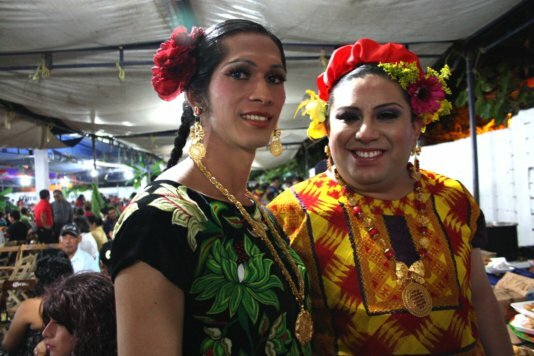 I only get dressed as a woman in Juchitan”, Shamira affirms. In spite of this, she admits that in the isthmus homosexuals are not as discriminated as in other parts of the country. “I have been in other regions, where discrimination is very stressed. If you’re dressed up like a woman you’re instantly pointed out as a weirdo”. The rural and proudly indigenous world of the Isthmus of Tehuantepec has given homosexuals a place that western society, in theory more progressive, very often denies them. 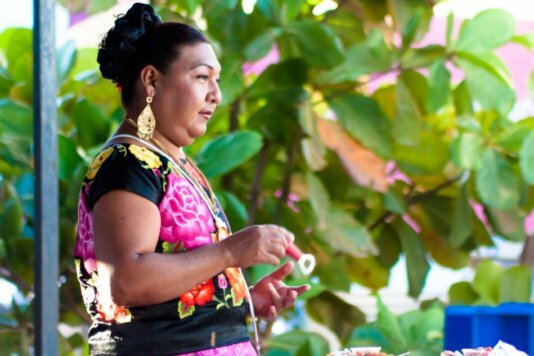 “Being muxe is to be part of a community which make itself respected, which has a privileged place inside Juchitan’s society and it’s accepted. Or, if not fully accepted, is patently more tolerated”, Shamira claims.